When To Schedule Dental Appointment | Do I Need A Dental Appointment? Have you ever had a toothache? The dull, insistent throbbing beats a painful tattoo into your head. You can’t think, you can’t focus. And of course it sharpens every time you take a drink that isn’t lukewarm. Soon, steak begins to lose its appeal. You find yourself basing your diet around room temperature applesauce and milk. This isn’t the kind of life you had envisioned for yourself! Let’s look at two kinds of reactions in this situation: The Alarmist and The Phobic. Scene 1: The Alarmist bites into an apple, feels a twinge, and immediately calls to schedule a dental appointment. Of course the dentist doesn’t have any open appointments for a few weeks, so The Alarmist chooses the earliest-available appointment, worrying the whole time about the mysterious toothache and its potential causes. A few weeks later, there are no symptoms of pain, so there’s really no use in going. But alas! Exactly one day after the missed appointment and one steak dinner later, the toothache strikes again! This time it’s more than a twinge. It’s more like a deluge: like being drowned in an ocean of pain. Cue panic mode. Cue the googling: “dentist appointment near me” “make a dentist appointment near me.” Cue an expensive visit to the emergency endodontist. Scene 2: The Phobic isn’t much of a fan of visiting the dentist. He keeps it as a last resort before dying, although he has resigned himself to the fact that he’ll probably need dentures somewhere down the road. But not today. Just seeing Highlights magazine is a trigger for when he was a kid and forced to go to a dental appointment. All those sharp metal tools winking up at him like they knew something he didn’t. He shudders just thinking about it. Once the pain has him on his knees, he’ll call to schedule a dental appointment. Then, and only then, will he lament the years of missed appointments. “Who is your regular dentist?” “What dental procedures have been performed on you?” “When?” The dental history questions pile up and The Phobic is left to suddenly re-evaluate his approach to the dental profession. This is a real problem. 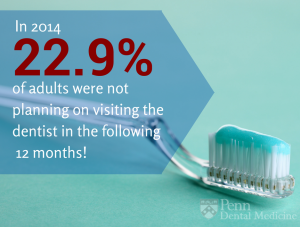 In 2014, 22.9% of adults were not planning on visiting the dentist in the following 12 months! However, when you look at the above scenarios, does either scene sound appealing? There’s an easy way to avoid being stuck in this position. Visit the dental clinic where you get good service and friendly staff: Penn Dental Medicine. Not only will you appreciate the new-found comfort of dealing with the best in the business, but PDM’s significantly lower prices enable you to schedule regular visits without worrying about your wallet. To take care of your teeth, all you have to do is let us take care of you. Related Tags: When To Schedule Dental Appointments | Do I Need A Dental Appointment?